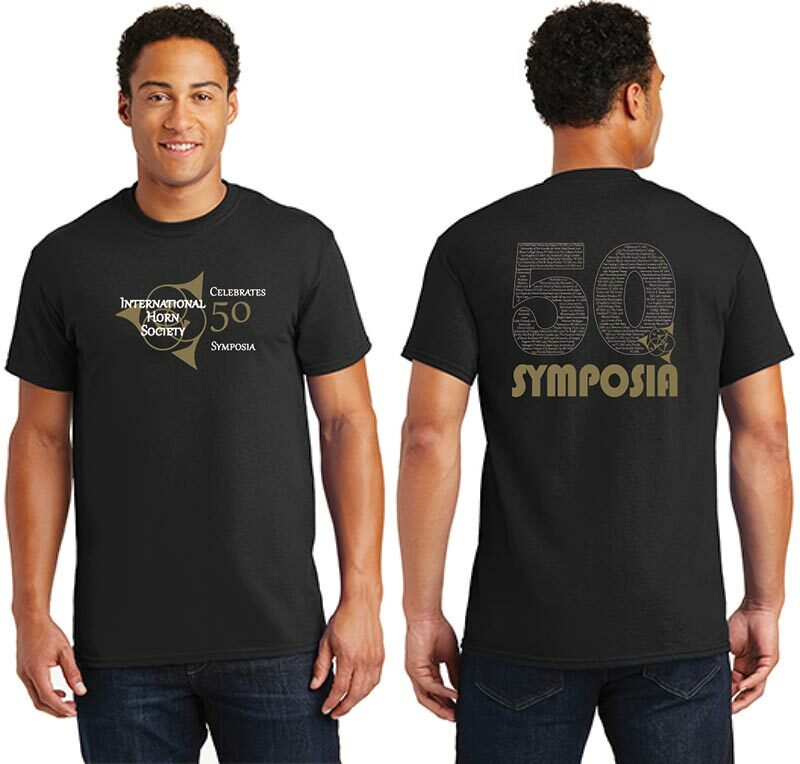 Limited Edition – 50 Symposia IHS T-shirt! Presale ONLY – Order now, pick-up at the Muncie Symposium (mail delivery after Aug 4 possible for a fee). We will only be ordering shirts based on our Pre-sales, so there will only be an extremely limited number of these shirts for sale at the Symposium. If you do not pre-order, you probably will not get one. These quality Black T-shirts have designs both front and back. The front design is in Gold Foil and White Ink. The back design is in Gold Foil, White Ink, and Gold Metallic Ink. 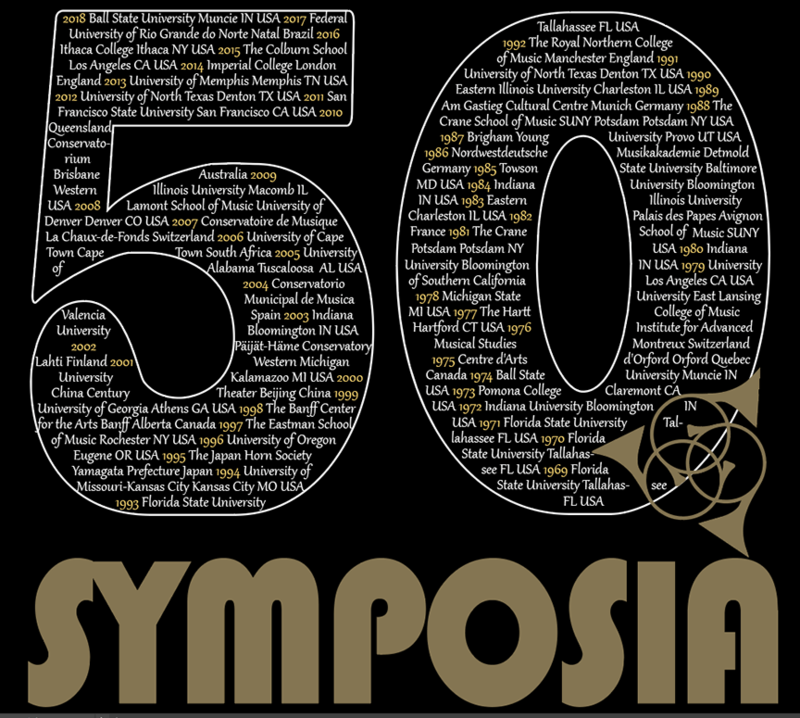 The back design lists every IHS International Symposium year and location for the last 50 years. Due to the special gold foil, two sided design, these shirts are a little more expensive than our usual (one sided) t-shirts. We have tried to keep the price down, but any profits that we make, go towards the expenses that the Society has supporting regional and international workshops, scholarships, publications, composition assistance and the website features. We are hoping to do some large group photos in Muncie where participants and show off their new shirts! Wait with bated breath until this summer’s Symposium in Muncie to get your first glimpse of your new shirt! Wear your shirt all week and participate in lots of photo ops! If you simply cannot attend the Muncie Symposium, you can wait by your mailbox for your shirt delivery by USPS Priority Mail, as soon as the Symposium ends. You can still enjoy wearing your shirt at any horn related event and at future Symposia, or even just while practicing.